This "Island Pad" is a great open layout 4br/4ba direct beach front home. This is steps and then the sand - with a huge beach front deck that spans the width of the house! This is on a 100 feet of beach front on the famed Ariola Drive on Pensacola beach, to the west is no house just small public access so it is a perfect location! The house is a new acquisition for the excited owners, it has been upgraded with some new furniture and decor so it is cute and affordable for a beach front home. If you thought you had missed your opportunity for a beach front home, you now have a second chance! There are two Master suites that are Gulf Front bedrooms with on suite bathroom. The first has a king bed and a full size pull out sofa and sleeps 4 with full bathroom. The second also has a king bed and full bathroom. The first interior room has a twin XL over a queen bed bunk bed, and another twin over twin bunk bed, that room sleeps 5, and has a brand new full bathroom. The last interior bedroom has a twin XL over queen bunk bed with full bathroom and a fold out twin , Sleeps 4. 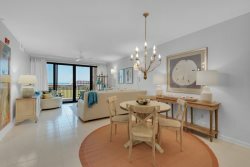 The living room is large cathedral ceiling with open floor plan, large table, new section couch, new bar stools for the kitchen Island seating and this leads out to the highlight of the house which is the Gulf Front Deck. The deck stretches the width of the house and is a great place to relax, grill out, and enjoy the tremendous beach views! The facility we had was perfect! Its very easy to communicate with the property owner, we get response in a very timely manner from the time of booking up to the end of our stay. There was a storm right before we arrived, and the grill got broken, but they went ahead and replaced it as soon as we need it. The property is clean, well equipped, and the location was perfect!